It has now been three weeks since the category five super typhoon Haiyan, one of the fiercest storms to ever hit land, ravaged forty one provinces of the Philippines. It feels like longer doesn’t it? Why is it that coverage of catastrophes seems to pass us by so quickly? A few weeks later and disgraced celebrities Nigella Lawson and Ian Watkins are at the forefront of conversation and as Glasgow mourns its helicopter crash victims, it is difficult to look at the bigger picture. From the headline of a BBC article, the Philippine nation pleads “please don’t forget us,” but aside from donating, all we do is wait and hope that victims receive the £55 million which has been donated to them by the UK. In the wake of harrowing initial reports of “appalling scenes of mass destruction,” our prime minister donated an extra £30 million alt hough an overwhelming amount of coverage has suggested that the global aid received by the Philippines is simply not enough. Many criticise the “rickety, decentralised and often corrupt Philippine political system,” questioning how fairly the aid is being distributed and why nobody is there to do it. Aside from what could be called ‘normal’ looting which is natural instinct for survivors in these desolate circumstances, aid trucks are being pillaged not only by armed gangs but by normal citizens who are left no choice but to take matters into their own hands. Philippine President Benigno Aquino III declared a “state of national calamity” due to “massive destruction and loss of life”. There have so far been 5600 confirmed dead but the estimation total is 10,000. Survivors and aid workers are tasked with the grizzly job of discovering the rest. Following catastrophes such as Haiyan, victims are forced to revert to basic human survival. Status in society has no impact because society itself has been put in a blender. Government officials, police and army officers have been caught up in the disaster themselves which has naturally hampered the coordination of aid efforts. 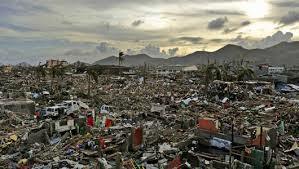 Thirty four of nine hundred and eighty three local policemen in Tacloban reportedly showed up for duty after the storm. Once a thriving city comparable in population to Aberdeen or Southampton, Tacloban now lies in ruins, a tangled mess of gutted houses, cars, trees and corpses which bore the full force of the howling winds and tsunami-like storm surges. Filipinos are used to typhoons – they have around 20 a year – but Haiyan (known as Yolanda locally) was no match for even the most robust safety measures they had in place. Authorities said they managed to evacuate 800,000 people but many evacuation centres proved no match for the super storm. In Tacloban, thousands took shelter in an indoor stadium which was considered storm-proof. The reinforced roof stayed on but the building was no match for a 5-metre (16-foot) high wall of water which smashed through it. Other roofs were peeled off “like cling film” by the savage gales. Haiyan’s labelling as a “perfect storm” seems grossly inappropriate given the scale of the destruction but in terms of its sheer size, its circular symmetry and the tightness of its eye, it seems designed to perfection; it’s ferocity set records. Gusts of over 300kph (186 mph) and “sustained” winds of 250 kilometres (160mph) an hour were inflicted on settlements in its path. Put a revving engine of a jumbo jet in your driveway and you get the idea. The poor quality housing in low-lying coastal areas stood no chance but again, despite the ferocious winds, it was the storm surge—an intense low pressure at the storm’s centre sucking the sea level upwards—that caused the worst damage. The Philippine National Red Cross said that people were not prepared for a storm surge at all. “It’s overwhelming,” said Air Force Capt. Antonio Tamayo. “We need more medicine. We cannot give anti-tetanus vaccine shots because we have none.” Another aid worker described it as “worse than hell”. As essential supplies slowly trickle in, Filipinos, just like survivors of hurricane Katrina and the 2010 Japanese tsunami, start to rebuild with what little they have, showing human resilience in the face of absolute despair. The UN estimates the total affected as 11million people. About 600,000 have been made homeless. That’s the whole of Glasgow. So although the world’s media has moved on, if you can do nothing else, let the plight of these people ease your worries because it could be worse, you could be there. 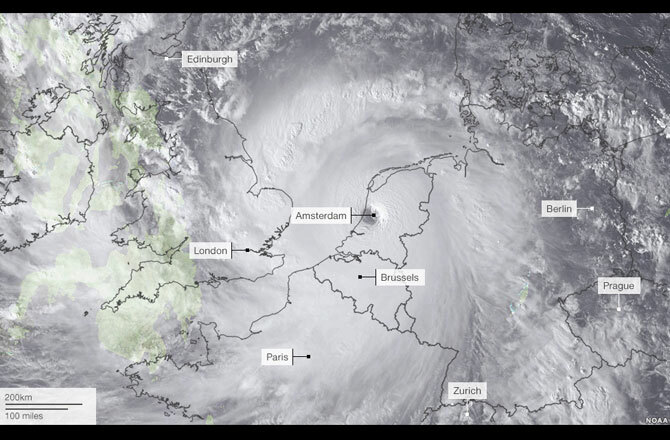 Posted in Features and tagged aid, Hurricane Haiyan, media coverage, Philippines, storm. Bookmark the permalink.